The crazy fronds of the Boston fern bring life to summer porches and homes everywhere, instilling a little vigor to otherwise plain spaces. They look great, at least until Boston fern leaf drop starts rearing its ugly head. If your Boston fern is dropping leaves, you’ll need to take quick action to slow or stop the leaf loss to keep your fern looking is best. Age of leaves – Older leaves will eventually dry and die. That’s just how it goes. So if you’ve got just a few dropping leaves and the care you’re giving your plant is otherwise excellent, don’t sweat it. 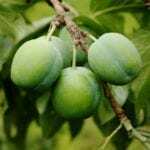 You may just want to put some effort into redirecting the long, thin stolons of the plant into the pot so new leaves continue to be produced. Lack of watering – Boston ferns need water and plenty of it. 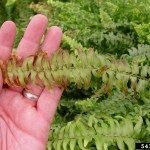 Although they can tolerate drier conditions than other ferns, they still should be watered every time the surface soil just starts to dry. Soak the plant’s soil completely, until water is running out the bottom. If you’re doing this, but it still acts like it’s dry, a big fern may need to be repotted or divided. Lack of humidity – Ambient humidity indoors is often severely lacking. After all, Boston ferns are native forest dwellers that rely on high humidity levels to survive. It can be difficult to maintain the 40 to 50 percent humidity that’s ideal for ferns throughout the year. 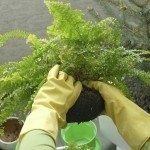 Misting does little, if anything, to help, but setting your Boston fern in a larger pot lined with peat or vermiculite and watering that frequently can keep humidity high around your plant. 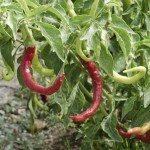 High soluble salts – Fertilizers are only needed in very small quantities, no more than a dose of 10-5-10 a month, even during heavy growth. When you habitually over fertilize, the unused nutrients build up in the soil. You may notice white flakes on the soil’s surface or your fern may turn brown and yellow in isolated areas. Either way, the solution is simple. Flush the soil repeatedly to dissolve and remove all of those excess salts and fertilize your Boston fern sparingly in the future.